Prior to Saturday’s rate hike in China, the Reuters/Jefferies CRB Total Return Index (CRB) broke solidly above key trend line resistance at the 320 level and closed the week at 329.38, despite overbought conditions. 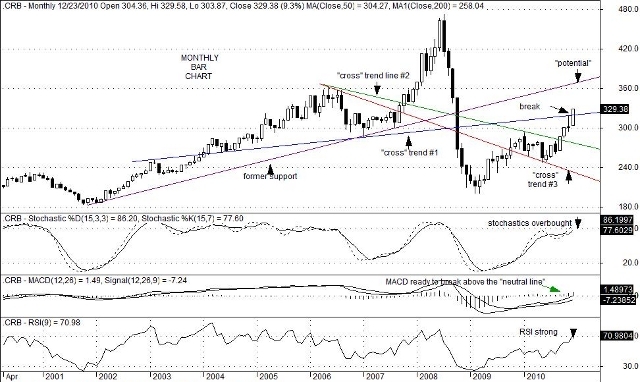 From a technical standpoint, this break suggests much higher levels for the CRB index, particularly since MACD readings on long-term (monthly) charts are on the verge of crossing above the “neutral line”. Such a crossing is generally consistent with “buyers” taking “control” from “sellers”. Many chartists and trend followers already know that cotton prices are at levels not seen since the Civil War; and that copper closed Friday’s session near all-time highs. Shortages in coffee and cocoa are pushing those prices solidly higher as well. Comments from Gulf Oil CEO Joe Petrowski on Thursday predicting crude oil will hit the $100/$125 range before the end of Q1 were also sobering. He also suggested that there was a 1-in-4 chance that the all-time $147 high could be exceeded by the Memorial Day. Moreover, he does not see this as a short-term problem. Nevertheless, Mr. Petrowski did suggest that if domestic 10-year Treasury yields were to rise above 4.5%, or if demand from China were to actually decline, oil prices could abate. As it stands from this vantage point, however, it appears that the CRB index is now aimed for a test of key trend line resistance located at the 368 level. If such a move were to occur, it would likely act as a form of “tax” on consumers that could, in turn, be a big negative for the economy, equity profits and equity prices in the coming months. This entry was posted on Thursday, December 30th, 2010 at 4:40 pm	and is filed under CRB Total Return Index (CRB). You can follow any responses to this entry through the RSS 2.0 feed. You can leave a response, or trackback from your own site.